There is a lot of talk on various aquaponics forums about the cost, purpose, experience and integrity of aquaponic training programs. Here’s a little about The Aquaponic Farming Course taught by instructors from Green Acre and Colorado Aquaponics. There are some reputable training programs out there and while we can’t speak for all of them, we can certainly speak for how we approach our course, our methods and the outcomes that we expect for our students. We openly encourage people to take as many courses as possible to hear different perspectives and approaches. There are several good courses out there. Some are more academic in nature and some are more experiential, some are very hands on and some are not. We suggest the participant do their homework up front, not only selecting an education provider that fits their needs, but to attend training from several vendors to get a well-rounded perspective. That being said, there are workshops advertising that you can make a million dollars on an acre in your first year, you can grow anything in aquaponics or aquaponics is so easy your grandma can do it. Good luck with all that… Making such statements creates serious misconceptions, is grossly irresponsible, and leads to unfortunate failures. We believe it is better to have an appropriate knowledge base and set realistic expectations and goals before going into the aquaponic farming business. While aquaponics has caught the attention of many and has become increasingly popular, it is still farming and still food production. It is just a more ecologically appropriate way to grow food however not unlike any other business, there are still successes and failures. There are people that can do really well in an aquaponics business, and others that might struggle in a given climate or marketplace. Our approach to revenue and profitability is extremely conservative and designed to teach people to start and grow responsibly within their means and be able to put together a farm appropriately aligned with their goals and objectives, their respective markets and climates among other key elements. We want to see farms successful over the long haul and not be another statistic in the growing line of aquaponic operations making a big splash early on and then folding up inside of two years. Startup businesses in general often go under within the first 3 to 5 years, so it is important to be prepared for the challenges in advance and avoid any unnecessary issues. The Aquaponic Farming Course is focused on aquaponic farming primarily with family, business partner or community focus in mind. While a hobbyist could learn a lot in our course, four days is likely much more than they would need to setup and run an aquaponics system to feed their family. Equally, the community scale farming approach is not intended to be for large scale commercial growing. There are big differences in system design, infrastructure, marketing, sales, business and financial planning, production levels, cost of entry and return on investment among many other things. The typical farm size our students are interested in ranges from 2,000 to 8,000 sf in scale. 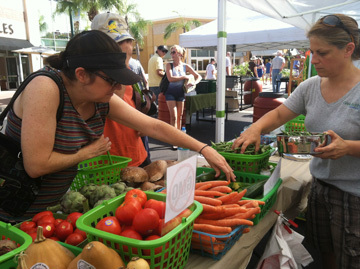 Students attending our course in the past have often been focused on various business models such as non-profits serving a food desert community or for profit ventures catering to farmers markets or local CSA’s – community supported agriculture customers or just to grow healthy food for themselves and their neighbors. Regardless of the motivation, the farm or community scale does not represent commercial aquaponics and is not likely going to be competitive with commercial growers who typically operate greenhouses over 50,000 sf. Commercial growers usually sell into larger wholesale markets and can have entirely different production, revenue and distribution models. We teach the business and financial aspects of aquaponic farming based upon real numbers and data that has been rigorously gathered from years of collective farming experience. 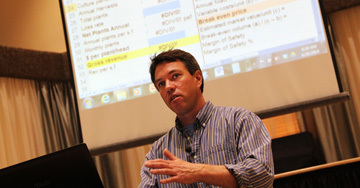 We walk students through the actual financials of our aquaponic farm here in Denver. What it cost to construct, how much it produces, along with price points, break even cost, margins, expenses and net returns. We integrate all of our crop production and yield data into the financial pro formas so participants are looking at real production data and how it ties to revenue. We calculate the ROI return on investment and demonstrate all of the variables and critical factors that influence a farms ability to be successful and profitable. There are many factors and we make a point to discuss all of those so that students are aware of the risks and challenges associated with aquaponic farming. Being risk adverse myself, I am the first to suggest that aquaponic farming is not for everyone. My job is to provide important considerations, data and tools so that people can make an informed decision before making both a financial, and perhaps more importantly, a significant personal investment in running an aquaponics business. 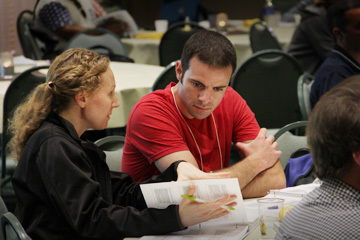 The Aquaponic Farming Course is about educating the participant without any additional agenda. We are in the business of growing food on the farm and growing minds in the classroom. We don’t have a system we are trying to sell. We provide free after class support for those that have questions about the course materials, electronic resources or drawings that they receive in the class. We do our best to respond to all student questions within a reasonable time frame and if a student requires considerable more support and assistance beyond the course, then consulting rates are discussed. We try to offer as much information in the classroom (as is achievable in four days) and answer as many questions as possible. 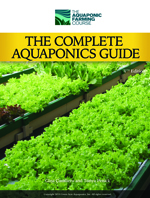 The Aquaponic Farming Course materials include construction plans for a hybrid-aquaponic farm system with various growing methods including media beds, deep water culture, wicking beds, vertical growing and aquaculture components. The type of system you choose to build or buy is going to largely depend on what your goals and objectives are for crop production, profitability, your climate, your markets etc… For example, the hybrid design we illustrate is best suited for a more diverse crop production which would work well for farmers markets and CSAs. 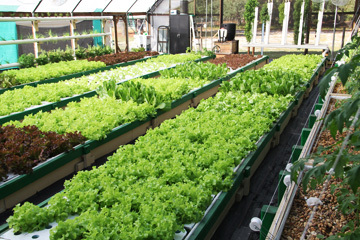 If your goal is to produce high volumes of bibb lettuce every week, then a well-designed raft or NFT – nutrient film technique system would be more appropriate. Your system design should be predicated on the crops that you feel you can consistently sell to your customers at the highest margins possible. 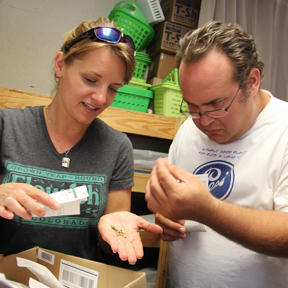 We teach people about aquaponic farming system design options so they can logically select the system components appropriate to their farming needs. Teaching is showing a student something is possible; learning is making it possible for themselves. We work hard to strike that balance and help participants prepare for a successful future in aquaponic farming or help them determine that aquaponic farming isn’t for them before investing a lot of time and money. 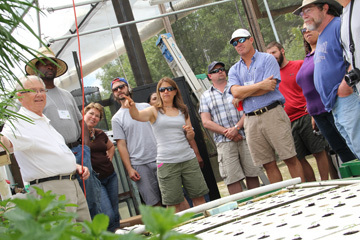 The Aquaponic Farming Course instructors have over 30 years combined experience educating others. Our job as educators, and what we specialize in specifically, is assimilating and delivering complex information to people in a way that they can absorb and comprehend without talking over their heads. We use a variety of methods to deliver information and reinforce key concepts in the classroom, through the materials and during the hands-on farm experience. 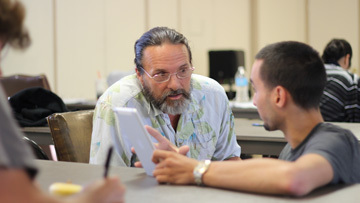 Teaching requires its own set of skills and techniques, which takes years of practice and experience. The most knowledgeable and experienced people don’t always make the best teachers, as solid teaching is based on understanding the student’s needs and being able to effectively communicate and convey information. This is true regardless of the industry and includes education from elementary to university level, as well as private courses. We feel that there is always room for improvement and we want to find the best possible methods to create the most valuable workshop experience. We have personally paid our hard earned money to attend courses through the years, and we think like a student when it comes to recognizing the value they are receiving. We provide our feedback forms at the beginning of class and ask that the students fill it out following each major section so our instructors get real quality feedback on their performance. While ratings are most often very positive, the evaluation tool is also about gathering the written feedback. We review those forms after each class and make adjustments as needed to improve the content delivery and student learning experience every time. This is simply an industry best practice for any reputable training organization and one that we use to constantly improve every workshop. Some people feel that paying for knowledge isn’t necessary and would prefer to learn through trial and error. While others value and respect those who have gone through the process and then can benefit by learning quickly and effectively in a shorter time frame. We learned a lot on our own, but valued both the money spent and the knowledge received for the workshops we have attended. While DIY (doing it yourself) is priceless, not everyone has years to work things out and would rather avoid costly mistakes by learning from others and applying their knowledge while developing their own. As for course offerings, most three to four day courses run from $995 to $1,500 on average across a wide variety of subjects and industries. 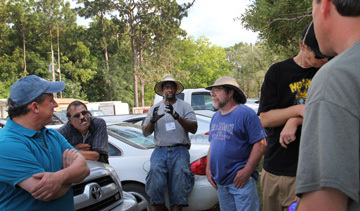 Our Aquaponic Farming Course is right in the middle at $1,295 and is a comprehensive four days. 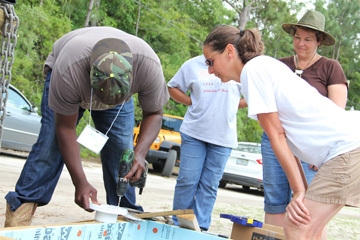 It is a combination of classroom instruction and invaluable hands-on learning to help reinforce concepts on the farm. In addition, students receive over 200 pages of written materials, the entire PowerPoint slide deck, system drawings, parts and vendor lists and several electronic resources including financial and production analysis tools to help them with their planning efforts and business goals. Can’t you learn everything you need to know on the internet? With the amount of bad information on the Internet or simply no information at all, it is nearly impossible for anyone considering aquaponic farming to have a solid understanding of the true realities, unless they stand face to face with people who do this for a living every day. You cannot replace the value of real life classroom instruction with YouTube videos. True education is a two way street that requires interaction between the student and the instructor. While you can get a lot of information from the Internet, you can’t always rely on its accuracy, nor can it be easily validated. Students need to ask questions, have a dialog with other people and discuss ideas and outcomes to become informed decision makers. It just isn’t possible to have that relationship or experience in a purely virtual setting. Let’s look at an example of real cost and value when it comes to instruction. My most recent aquaponic farm in Denver cost $25,000 in materials to build and occupies 3,200 gross sf, so $7.81 psf not including our labor time to build it. A typical polycarbonate greenhouse costs on average about $22 psf for materials, installation and mechanical equipment and controls. Assuming you’re building the aquaponics system yourself you are already at $29.81psf or $95,392 in initial capital outlay. This does not include purchasing property, site preparation, utilities, permitting and regulatory expenses or any initial system startup costs or the working capital you will need to cover an operating deficit in the beginning. So for the sake of simplicity let’s say you are looking at a minimum of $100,000 for a nice greenhouse and aquaponics system for your first venture into aquaponic farming at the scale of 3,200sf. Spending 1% or even less towards your education and due diligence in planning for your new business and life venture in aquaponic farming is one of the smaller line items. And making this investment in knowledge is SUBSTANTIALLY less expensive than costly mistakes that can easily be avoided with the proper information. It is also worth considering the amount of time and resources you save going to a course that is packaged to deliver a large portion of critical information. 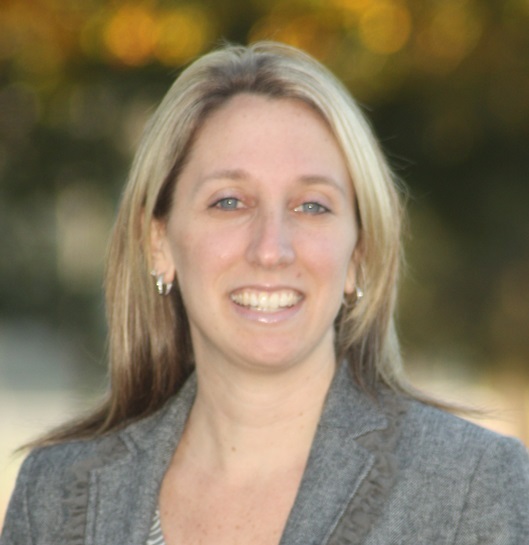 This information has taken years to put together and will allow the student to get started and get to market much more quickly. 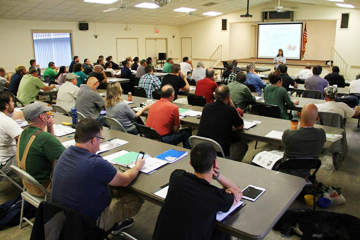 While going to a course is no guarantee for success it will strongly increase your probability of success if you have the opportunity to spend four days with knowledgeable people who have already gone through the up and downs of starting their own aquaponic farms and businesses. We strongly emphasize the importance of business, financial and market planning to our students before they go out and start building an aquaponic business. Your initial business planning and market research efforts can often cost you nothing more than your time up front. Running a small hobby system and operating an aquaponics farm where your income is reliant on maintaining a stable environment and consistently delivering high quality produce to your customers is two completely different worlds. When you are running a farm you are running a business that requires tight controls of products coming into and out of your farm. In addition to the skills required to manage all of the living elements of the aquaponic system you have to manage your profit and loss, your cost centers, control systems, monitoring systems, suppliers, inventories, customers, accounting systems, marketing plans, competitors, distributors, food safety regulations, insurances, licensing and permits and on and on and on. We look forward to a time when aquaponic farms are a prevalent part of both rural and urban settings. We believe that family farms in schools, apartment complexes, retirement centers, and places of worship may become commonplace. These systems can help educate and feed the community healthy foods, support the local economy with green jobs and create local commerce. We know this possibility can become a reality because we run aquaponics farms that do just that. We interact with other aquaponic farmers making their living this way, and encourage others to learn how they can achieve this goal as well. We enjoy teaching people about aquaponics, and champion both the home hobbyist as well as the person with the entrepreneurial spirit, committed to making a difference. So whether you learn from DIY experience or you decide to get many years of education condensed into a course, you are on your way to helping the aquaponics industry become a viable and important part of the food solution. JD founded Colorado Aquaponics in 2009 and has been building aquaponic systems and providing education for schools and communities throughout Colorado since. 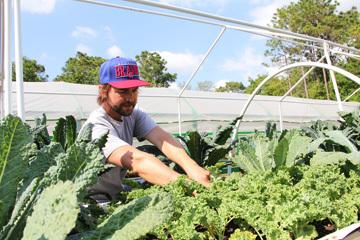 In 2012, JD joined The Aquaponic Farming Course team as an instructor until leaving in 2015 to manage The Aquaponic Source.